Hi! I have recently update my windity app, and i notices that on the previous version I could read clouds altitudes in feets or meters. On the new version i dont know where to configure this so as to read it in feets. @Victor-Ortelli If you using Android, try clicking on the layer menu. Then scroll down until you see settings, click on the advanced settings button. Go to the waves units, change them to your desired units. At least on my device, it changes both waves and cloud measurements. I don't know how to do it in iOS, but it should be fairly similar. Hopefully, this works for you. @Victor-Ortelli OK, I think I found out how to fix it now. In your iOS app, open a meteogram for any particular location. And where is says cloud base, click on the unit next to where it says cloud base. Hopefully this helps. @theradarguy Thanks! This could be a solution, but do you know where i have to configure so as to see the cloud base altitud in feets over the map when i press on a location for example? 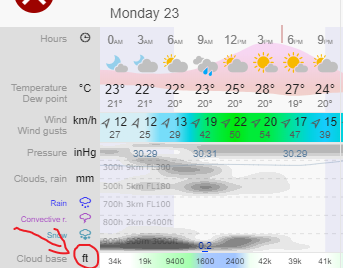 Because i can only configure waves, Temperature, rain, pressure but not clouds..
@Victor-Ortelli If you change the cloud base units in the meteogram, it will also change the units for the map. @theradarguy I tried but it doesnt work , i have feets in metrogram an on the map i see it in meters.. i dont know..thanks!